Once you begin selling tickets to your event, you’ll want to know how your sales are going. 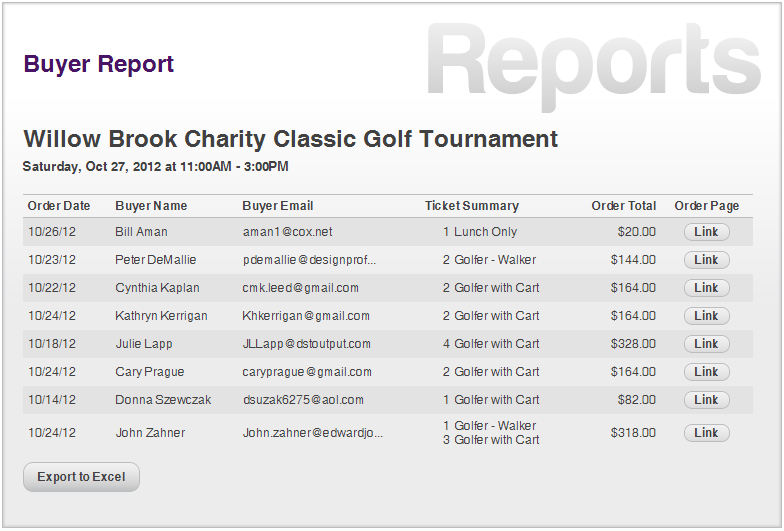 The Reporting tool allows you to view, manage, and analyze data on your event’s ticket sales and attendees. Reporting options are accessible from the Event Information page. To access the Event Information page, click the Manage Events link at the top of the page. This will bring up a list of your events. Clicking the name of an event or clicking the Information link in the row next to an event name will take you to the Event Information page for that event. At the bottom of the page, underneath the Order Summary, will be reporting buttons. The buttons will vary depending on whether or not you chose to use advanced options on the Customize page such as Attendee Information and Participant/Pledge Forms. Clicking the Buyer Report button will take you to a report that has detailed information about each order, including Order Date, Buyer Name, Buyer Email, Ticket Summary, Order Total, and Order Page. Clicking the Link button under the Order Page will take you to the buyer’s order page, which will include their receipt and tickets. The report can be exported to Microsoft Excel with one click of the Export to Excel button. The Excel report will provide you with additional information, such as Order Number, Attendee Name, and whether or not the ticket has been redeemed. 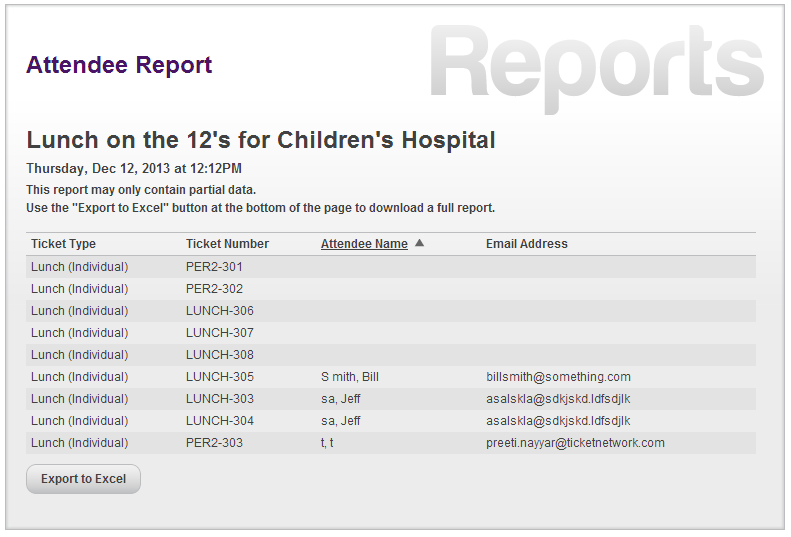 Clicking the Attendee Report button will take you to a report that summarizes the Attendee Information you gathered. This button will only be available if you enabled Attendee Information on the Customize screen. The report has detailed information about each attendee, including Ticket Type, Ticket Number, and any additional information you selected in the Attendee Information screen. The report may only contain partial data if you’ve enabled multiple lines of information or added in custom questions. The full report can be exported to Microsoft Excel with one click of the Export to Excel button. 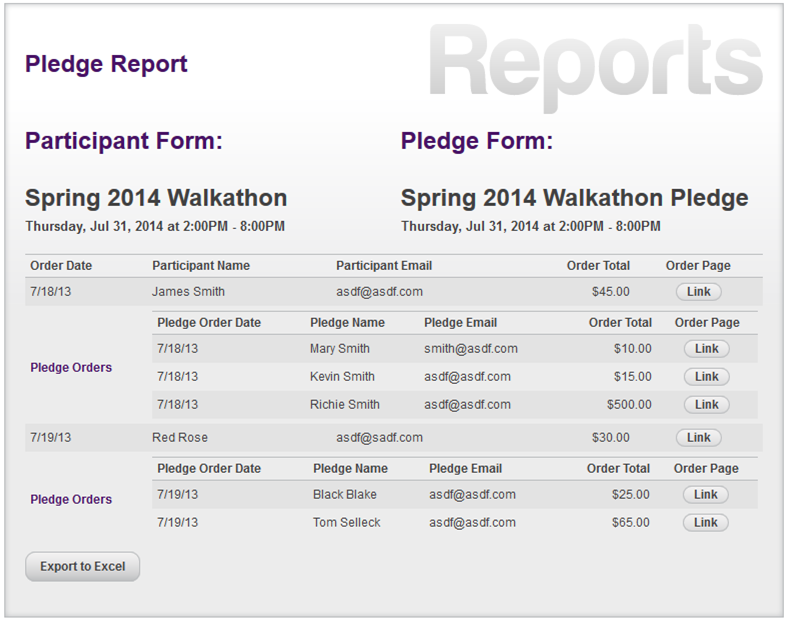 Clicking the Pledge Report button will take you to a report that has detailed information about your pledge event. This button will only be available if you decided to use Participant/Pledge Forms on the Customize screen. The report has detailed information including Order Date, Participant Name, Participant Email, Order Total, and Order Page. Clicking the Link button under the Order Page will take you to the buyer’s order page, which will include their receipt and tickets. If a participant has received pledge orders, they will be listed under the participant’s name. Information you'll find about the pledges includes Pledge Order Date, Pledge Name, Pledge Email, Order Total, and Order Page. The report can be exported to Microsoft Excel with one click of the Export to Excel button. In the Excel file, a Participant Report will be on one tab and a Pledge Report will be on another.